Whatever the celebration Mobydisc has the music! Every party, every birthday (regardess of age), every social club or work function, school dance, anniversary, engagement or club dinner needs atmosphere. And creating just the right atmosphere with the right music is what your Mobydisc DJ does best. For 30 years Mobydisc have been turning ordinary occasions into extraordinary celebrations. Why does Mobydisc make such a difference? Is it the choice of music, the brilliant sound equipment, the expert DJ, the help with formalities, the organizing of games and prizes for childrens' parties or the dance lighting. The answer is, they all add up to the Mobydisc difference! That's why they're all included to guarantee your fun when Mobydisc comes to the party! 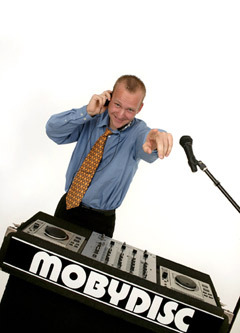 Your professional Mobydisc DJ is an expert at playing just the right songs for every moment. But if you want to choose your own, simply go to the exclusive Mobydisc online song selector. And remember, you can always bring your favourite songs on your iPod, iPad, smart device or laptop, that you want your Mobydisc DJ to play. What isn't? There's special effect dance lighting, a mike for speeches, an expert DJ who can make announcements or act as the parties MC. There's a music system that sounds great at all volumes and a vast music library for all tastes and all ages. The mike provided by Mobydisc plugs into the same state-of-the-art music system that provides the music and is adjusted by your Mobydisc DJ to just the right level. And if the speeches will be taking place well away from the dance floor, you can request in advance a cordless microphone. Grab the mike and get your guests involved with a wide range of popular backing tracks and the lyrics displayed full screen.